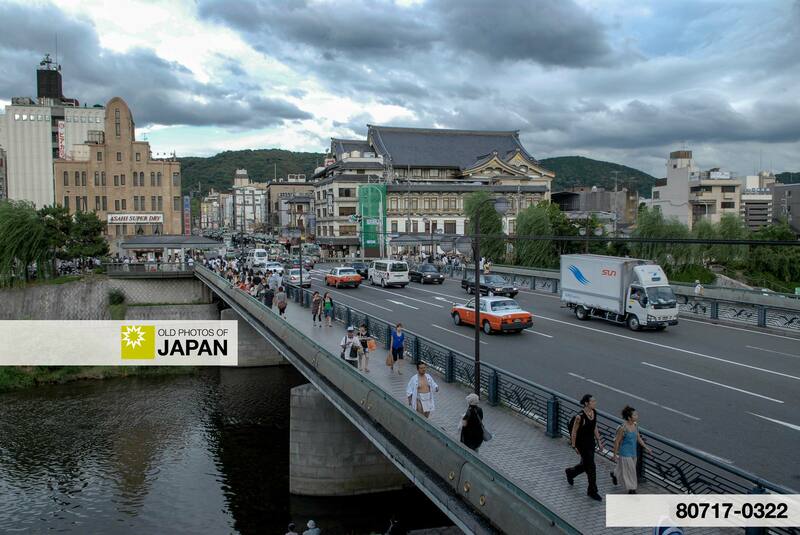 A view on Shijo Ohashi (Shijo Great Bridge), one of Kyoto’s most important bridges on the river Kamogawa. Crossing the bridge and walking towards the mountains brought visitors to Yasaka Jinja, the shinto shrine that originated the famous Gion Matsuri. The road towards Yasaka Jinja is quite wide nowadays, but on this photo it is still narrow. The crowd on the bridge includes rickshaws and pedestrians holding Western style umbrellas. To distinguish them from Japanese umbrellas, these were called Komorigasa, literally bat umbrellas. According to temple records (社家記録) of Yahata Jinja, the first bridge at this location was built in 1142 (Eiji 2). It wasn’t yet called Ohashi because it was a small bridge. This bridge however played an important role in Kyoto as it allowed both the Gion procession and pilgrims visiting the shrine to cross the Kamogawa. 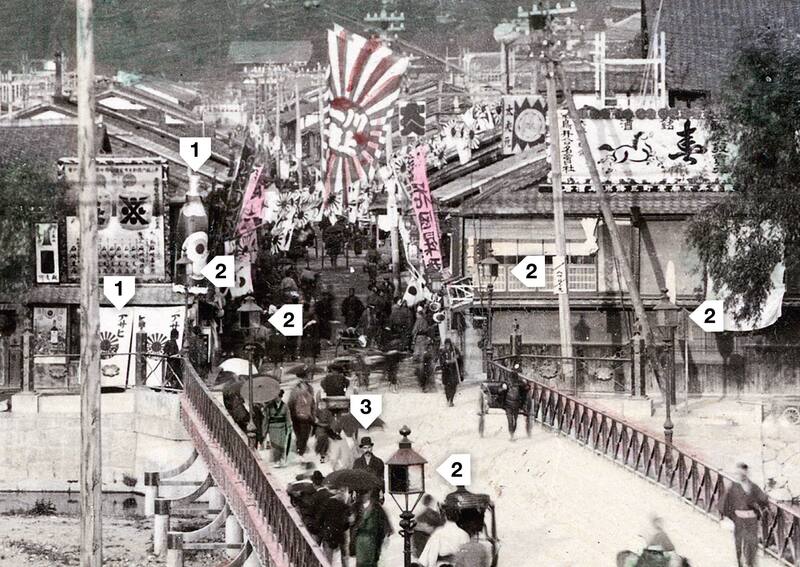 The first Shijo Ohashi was completed in 1857 (Ansei 4). It consisted of a wooden bridge on stone pillars. Because of the river Kamogawa’s recurrent flooding, bridges were often washed away. A fate that repeatedly befell the old Shijo bridge as well. It therefore didn’t make sense to build expensive big bridges. Instead, the people of Kyoto used ferries or built simple bridges. These usually reached from both banks unto one of the many sandbars in the river, which were filled with small restaurants and theaters. When such bridges were destroyed in floods, they were quickly rebuilt at small expense. An unrelated, but interesting aspect of these Kamogawa bridges was that they were separated into bridges for pedestrian use and bridges for the transportation of goods. This detail shows an ad for Asahi Beer, the lanterns on the bridge and even a man with bowler hat and mustache, probably a Westerner. Although this scene might appear traditional and nostalgic to us, to the inhabitants of Kyoto of this time it must have appeared very modern. The bridge was made of iron, people used Western umbrellas, there were lots of rickshaws, there was a large ad for Asahi Beer, and there were electricity poles alongside the bridge. All of them Meiji innovations. This video clip shows the area around Shijo Ohashi as it looks today. 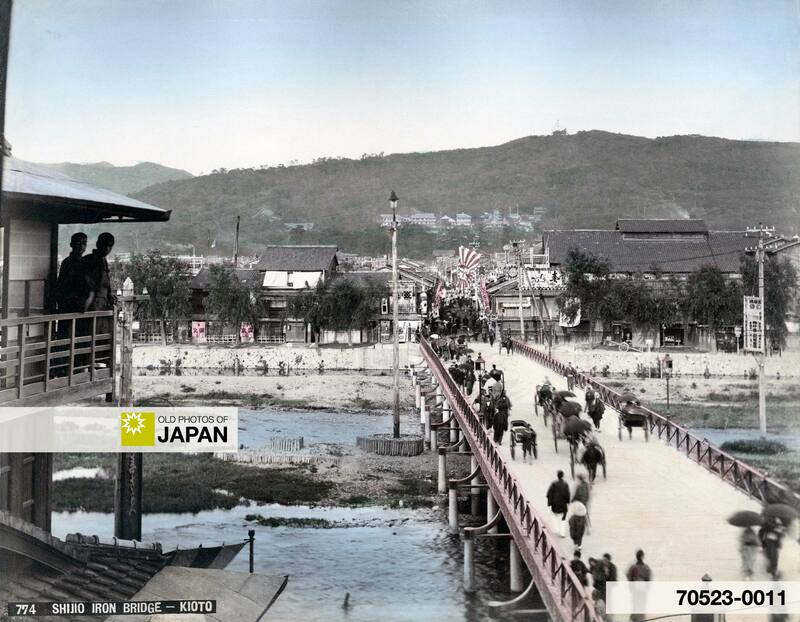 For another view of the river Kamogawa, see Kyoto 1890s • Kamogawa. 2 京都ホテル１００年ものがたり 。２６．「也阿弥ホテル」の火事。 Retrieved on 2008/07/01. You can also licence this image online: 70523-0011 @ MeijiShowa.com.